Kiteflying Around Containers – A Better Alternative to Course VMs? Eighteen months or so ago, I started looking at ways in which we might use a virtual machine to bundle up a variety of interoperating software applications for a distance education course on databases and data management. 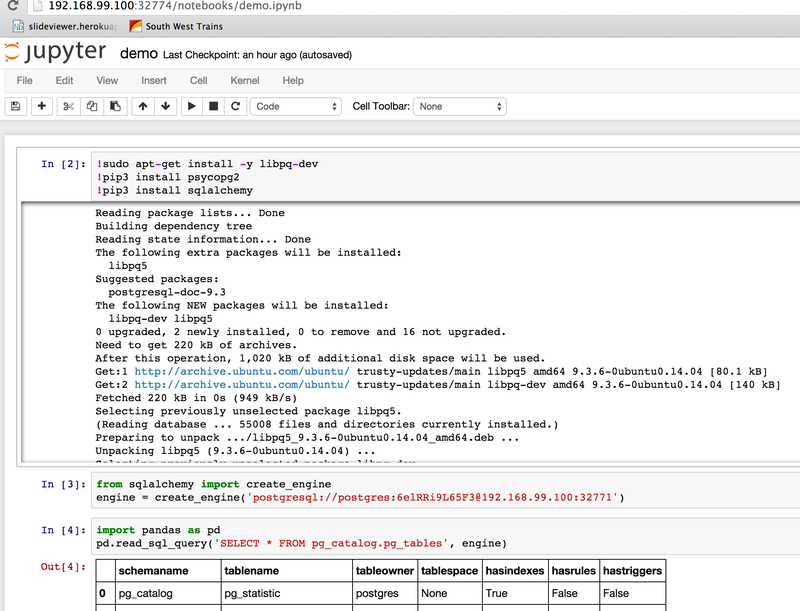 (This VM would run IPython notebooks as the programming surface, PostgreSQL and MongoDB as the databases. I was also keen that OpenRefine should be made available, and as everything in the VM was being accessed via a browser, I added a browser based terminal app (tty.js) to the mix as well). The approach I started to follow was to use vagrant as a provisioner and VM manager, and puppet scripts to build the various applications. One reason for this approach is that the OU is an industrial scale educator, and (to my mind) it made sense to explore a model that would support the factory line production model we have in a way that would scale vertically as a way of maintaining VMs for a course that runs over several ways as well as horizontally across other courses with other software application requirements. You can see how my thinking evolved across the following posts: posts tagged “VM” on OUseful.info. could the same process be used to manage the deployment of application sets to students on a cloud served basis, either through a managed OU cloud, or on a self-served basis, perhaps using an arbitrary cloud service provider. 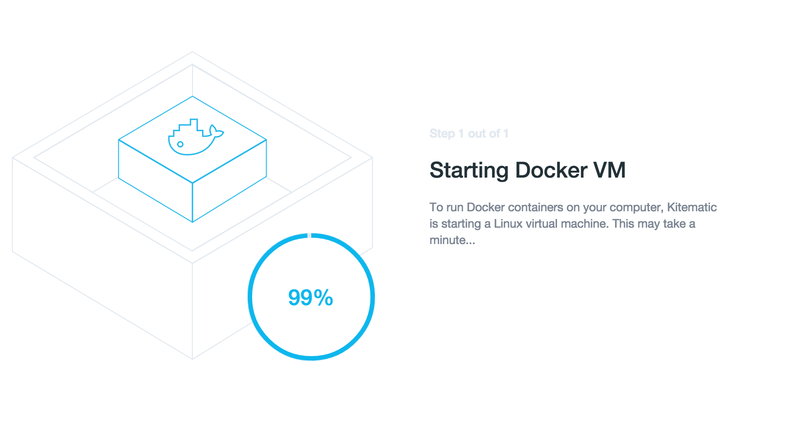 Find a container you want, and select it – this will download the required components and fire up the container. 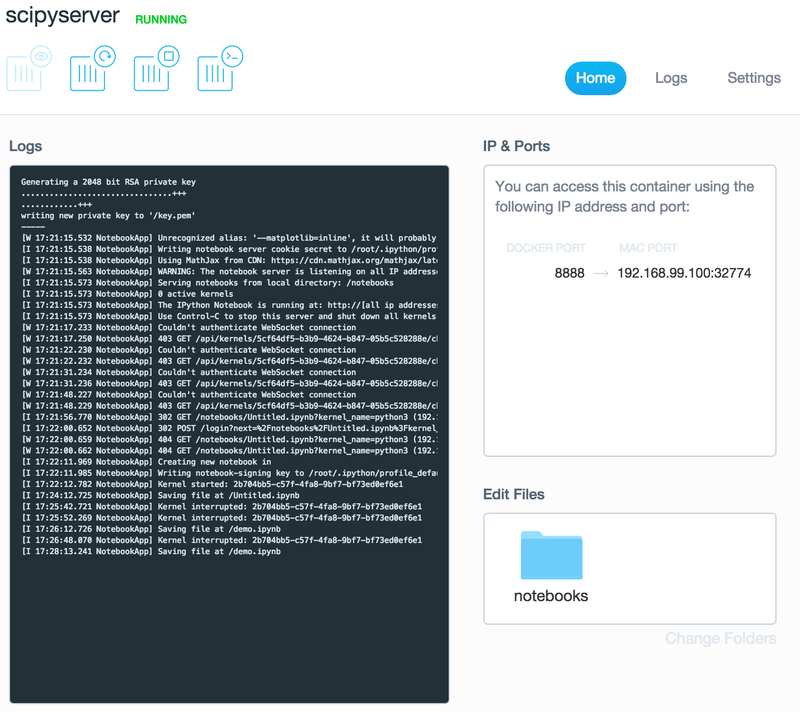 The port tells you where you can find any services exposed by the container. 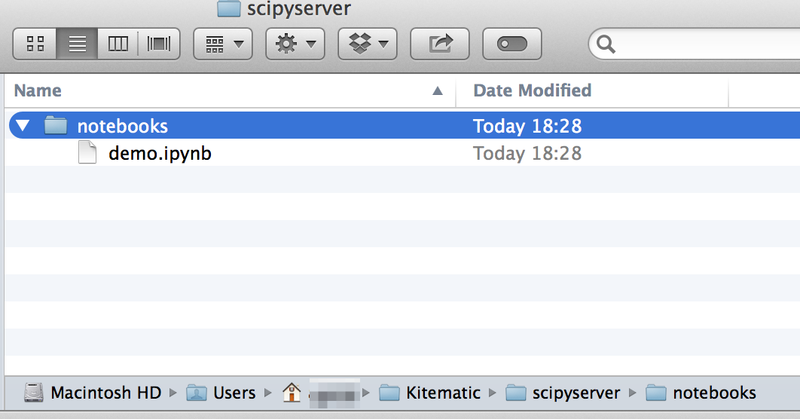 In this case, for scipyserver, it’s an IPython notebook (HTML app) running on top of a scipy stack. Looking at the container Edit Files settings, it looks like I may also be able to share across the database datafiles – though I’m not sure how this would work if I had a default database configuration to being with? (Working out how to pre-configure and then share database contents from containerised DBMS’ is something that’s puzzled me for a bit and something I haven’t got my head round yet). So – how does this fit into the OU model (that doesn’t really exist yet?) for using VMs to make interoperating software collections available to students on their own machines? First up, no Windows support at the moment, though that looks like it’s coming; secondly, the ability to mount shares with host seems to work, though I haven’t tested what happens if you shutdown and start up containers, or delete a scipyserver container and then fire up a clean replacement for example. Nor do I know (yet?!) how to manage shares and pre-seeding for the database containers. One original argument for the VM was that interoperability between the various software applications could be hardwired and tested. Kitematic doesn’t support fig/Docker compose (yet?) but it’s not too hard to lookup up the addresses paste them into a notebook. I think it does mean we can’t provide hard coded notebooks with ‘guaranteed to work’ configurations (i.e. ones prewritten with service addresses and port numbers) baked in, but it’s not too hard to do this manually. In the docker container Dockerfiles, I’m not sure if we could fix the port number mappings to initial default values? One thing we’d originally envisioned for the VM was shipping it on a USB stick. 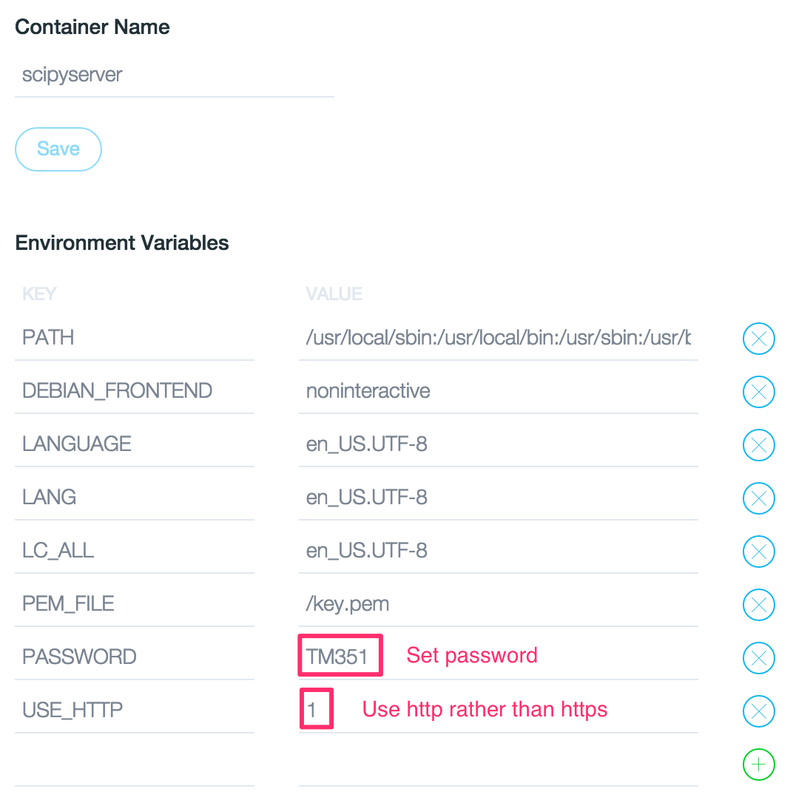 It would be handy to be able to point Kitematic to a local dockerhub, for example, a set of prebuilt containers on a USB stick with the necessary JSON metadata file to announce what containers were available there, so that containers could be installed from the USB stick. 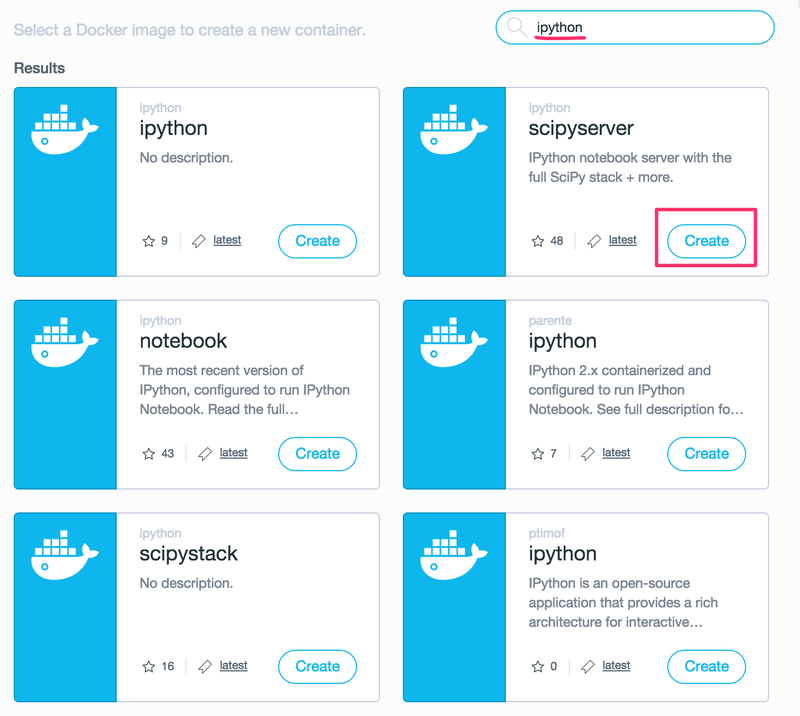 (Kitematic currently grabs the container elements down from dockerhub and pops the layers into the VM (I assume? ), so it could do the same to grab them from the USB stick?) In the longer term, I could imagine an OU branded version of Kitematic that allows containers to be installed from a USB stick or pulled down from an OU hosted dockerhub. Thanks for this. 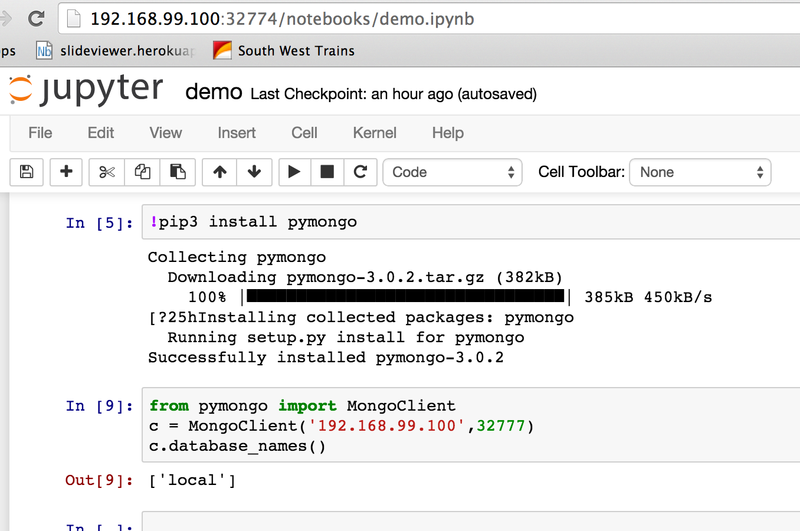 Was struggling with getting the IPython Notebook running until I found your step by step. Hadn’t twigged that the issue was the https by default. I guess there is a way of setting up certificates to work properly but it seems a little too deep in to be easy and this was much simpler for what I wanted (running sandboxed notebooks locally). 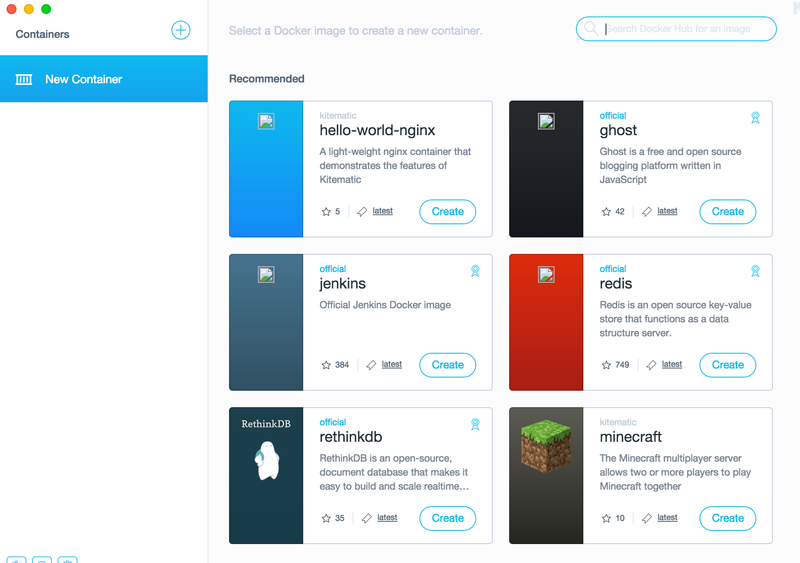 Now if I could just figure out how to persuade kitematic to do a docker run -it I’d be even happier. Guessing I need to revert to the command line for that so I can package up some images for myself. Previous Previous post: Whither the Library?